Tonight we checked out first whether we could be heard considering the previous week we'd had audio problems, and the live chat room could only hear Henry for the start of the show. Kat reported seeing the young man ghost again at her new home, when Skype dropped her from the show/call, when Skype arbitrarily updated itself on her computer, as it had when I'd logged on earlier before the show. While we were trying to recover Kat, I read The Haunted December story, from 2013 True Ghost and Paranormal Stories..
Kat managed to get back on the call, and concluded her story about her young man ghost, even that her para-pup Portuguese Water Dog Wheatley had seen the ghost as well. Ceiling Cat Barbara Duncan spoke about Christmas superstitions, both positive and negative. We discussed Christmas Figgy Pudding. Kat later realized she'd actually meant plum pudding. CC reported out having listeners in the US, Australia, Canada, England, and Thailand. From the same page, I read Sounds of Approaching Death which ended regarding phone calls from the dead. Kat spoke about the controversial Cincinnati, Ohio Zombie Nativity scene/event. CC continued, regarding people telling ghost stories at Christmas/Christmas-time. We discussed favourite Christmas movies, including but not limited to It's a Wonderful Life; Love, Actually which Henry confessed not yet having seen; National Lampoon's Christmas Vacation Scrooged; Home Alone; Mr. Magoo's Christmas Carol and the George C. Scott-starring A Christmas Carol, as well as the definitive Alistair Sim version; A Charlie Brown Christmas and How the Grinch Stole Christmas, as well as its okay Live Action version; Jingle All the Way, et al. CC reminded us of Gremlins, which Kat has not seen, unaware it's not properly a horror film. Henry mentioned the Michael Keaton Jack Frost nightmare movie was referenced, but I pointed out the MST3k Jack Frost as being far more entertaining. Kat added Santa Claus Conquers the Martians, which I clarified as being best viewed via the Rifftrax, the MST3k, or the Cinematic Titanic versions. Staying with horribly-made movies, I also added the 1958 bizarre Mexican movie MST3K sent-up: Santa Claus which is also viewable on YouTube; there is also a brilliant Rifftrax version. Also touched on were such "holiday" films as Bad Santa, Ernest Saves Christmas, Elf, Holiday Inn, White Christmas, and The Magic Christmas Tree. Henry revealed his favourite Christmas movie as being One Magic Christmas; Kat indicated hers as being Nightmare Before Christmas. I'd already pointed out mine being It's a Wonderful Life and (doubling as my favourite romantic comedy), Love, Actually. I then read the Pretty Young Ghost story. We discussed various Christmas songs. Kat told the story of the Christmas Pickle, and the Pooping Yule Log, aka Tió de Nadal. I mentioned the Weeping Angel christmas tree topper. Kat concurred her mutual dislike I have for the watered down, Hollywood-ized A Christmas Story; I clarified my being spoiled with such PBS TV movies of Jean Shepherd's stories, a la Phantom of the Open Hearth. I provided my Paranormal View hub page on my website, indicating people from there can find the show's respective report pages, and that we're very findable on Facebook, the official Paranormal View page page, and invited everyone to Follow Me on Twitter at @realbadger. 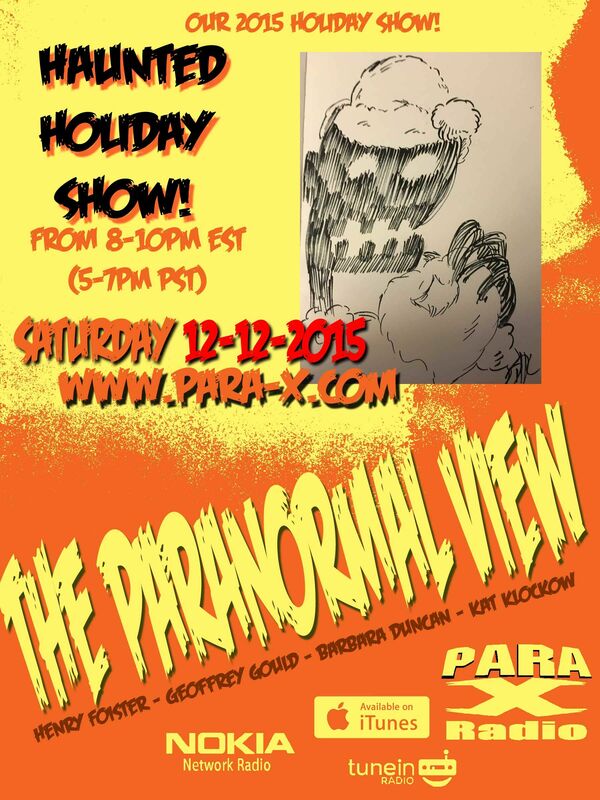 Kat gave out about the show being on Twitter at @Paraviewradio, and her jinxed.com site but not her katklockow.com site.